Our lab areas of expertise include: hearing loss; psychoacoustics; speech recognition; speech quality; noise and reverberation; informational masking; digital signal processing; suprasegmental and prosodic cues; aging; and cognition. To get clear experimental results, auditory researchers require well-controlled environments like sound-proof booths. These environments are not, however, reflective of everyday environments. In fact, many audiology patients complain that their ability to communicate changes drastically between the clinic test situation and the real world. We are exploring the effects of realistic environments–such as restaurants and concert halls–to better understand how these factors affect auditory perception. 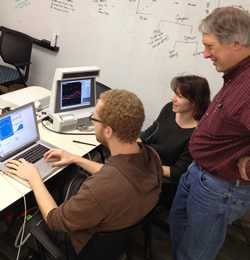 With a focus on factors including noise, reverberation (echoes), sound localization (identifying where the talker is), our lab hopes to better understand how hearing-impaired listeners hear in challenging, real-world environments. We hope to deepen this understanding by considering other factors that impact communication in real-world environments, including both hearing aid processing strategies and cognitive ability. Ultimately, the goal of this research is to apply hearing science beyond the laboratory. As we get older, it becomes more difficult to understand speech, especially in background noise. This is partly due to loss of hearing sensitivity, but also to changes in auditory and cognitive processing. A longstanding focus of our work is to understand why some older listeners hear differently than younger listeners, and whether hearing devices for those listeners should be fit based on specific abilities. This series of projects, funded by the National Institutes of Deafness and Communication Disorders, measures how auditory and cognitive differences among older patients affect their response to specialized digital signal processing. Signal-processing strategies of interest include multichannel wide-dynamic range compression, digital noise reduction, and frequency lowering. Our recent work demonstrated that both working memory and listener age influence response to signal processing. We aim to better understand the effects of age on the peripheral and central auditory systems. We also hope to develop a battery of clinically-usable tests that can be used to measure individual cochlear and central processing differences, so that hearing aid signal processing can be better customized for each patient. For more information, see “Age, hearing loss and cognition: susceptibility to hearing aid distortion” [pdf].